Do you have a bad boss who’s sucking all the joy from your life? Chances are it’s costing you money, success, health and happiness. Did you know happier employees have higher levels of productivity, produce higher sales, perform better in leadership positions, receive higher performance ratings and higher pay and enjoy more job security? In fact, the latest scientific evidence from more than 200 studies of 275,000 people around the world tells us that happiness and positivity doesn’t simply reflect success and fulfillment; it also produces it in nearly every domain of life, including work, health, friendship, sociability, creativity and energy. Is your bad boss is keeping you from all of this? While I certainly was relieved to escape each bad boss I’ve encountered at work, it wasn’t until I met Barbara Fredrickson from the University of North Carolina, often described as the “genius of positive psychology”, that I really started to understand what these bosses where costing by robbing me of positive emotions like joy, interest and pride in my work. Barb explained our brains are literally hardwired to perform at their best – not when they’re negative or even neutral – but when they’re positive. A rare state when you’re enduring a bad boss. Yet Barb’s research has repeatedly demonstrated that positivity – or the lack thereof – doesn’t just change the contents of our mind, trading bad thoughts for good ones; it also changes the scope or boundaries of our psyche by broadening and building us. Positivity opens us up to be more creative and receptive – even towards a bad boss. Studies show that it literally expands our peripheral vision, allowing us to see more than we typically do. In addition, it floods our brains with dopamine and serotonin and enables us to make and sustain more neural connections so that we can organize new information, think more quickly and creatively, become more skilled at complex analysis and problem solving, and see and invent new ways of doing things when it comes to managing our bad boss. It also alters how we see our connections with others so that we look past what separates us – like racial differences – and think more in terms of “we” and less in terms of “me”. It can help us be more tolerant towards others – perhaps even a bad boss. The best part is by opening our hearts and minds, positive emotions allow us to discover and build new skills, new ties, new knowledge, and new ways of being. As our positive emotions accrue, they also build up our psychological, intellectual, social and physical resources, leaving us better equipped to face a bad boss. We become more optimistic, more resilient, more open, more accepting, and more driven by purpose. And what’s more, we cultivate more open-minded mental habits, ignite better connections with others and improve our biological markers for health so that we can lower our blood pressure, experience less pain, have fewer colds and sleep better. Leaving you in perfect form to overcome your bad boss! My favorite part of Barb’s research is her discovery that positivity obeys a tipping point – even in the face of a bad boss. She’s found when we encounter at least three heartfelt positive emotional experiences that uplift us, for every heart-wrenching negative emotional experience we endure, a tipping point occurs, which predicts our ability to see new opportunities, bounce back from setbacks, connect more with others, and reach our potential. As part of her work she also notes that appropriate negativity – that we can learn from rather than be shamed by – is a necessary ingredient in life, which keeps us grounded in reality and may even provide a practical use for a bad boss. Barb suggests that the goal is not to banish heart-wrenching negative emotions, but to balance them with enough heartfelt, positive ones (around 3 to 1) so that they no longer leave us to languish. Increasing the numerator (the number of positive emotions you’re experiencing). Decreasing the denominator (the number of negative emotions you’re experiencing). This doesn’t mean painting on a smiling face, wishing away your bad boss with positive thinking, or pretending they don’t exist. Rather, it’s about creating moments of heartfelt joy, gratitude, peace, curiosity, hope, pride, laughter, inspiration, awe, and love that arise from how you interpret events and ideas as they unfold – inspite of your bad boss! Creating “Jolts of Joy” in your day – Counteract the impact of your bad boss by sprinkling some Jolts of Joy – moments that bring a genuine smile to your face – to short circuit the negativity caused by your bad boss. Create a list of the things you can do in ten minutes or less at work that will make you feel good. This might include finding a quiet place to meditate, putting a favorite song on your ipod, taking a quick walk outside, watching a funny clip on youtube or calling a friend. All proven mood boosters. Breaking the grip of rumination – Our brains are programmed so that when we dwell on a bad boss, we can’t see the big picture and think clearly so instead we selectively call to mind more and more negative thoughts, thereby creating adownward spiral of despair and multiplying our pessimism exponentially. Create a list of positive distractions from your bad boss – like exercising or doing something kind for someone else – that you can reach for when you find yourself pointlessly ruminating. Cultivating optimism – Most of us have particular habits when it comes to explaining how good and bad events happen to us – particularly around a bad boss. It turns out there are three important dimensions that impact our explanations: personal (“me-not me”), permanent (“always-not always”) and pervasive (“everything- not everything”). Optimistic explanations find permanent and universal causes of good events and temporary and specific causes for misfortune to leave us feeling more hopeful for the future. Being optimistic involves a choice about how you see your bad boss. Remember, the goal is not to eliminate negativity, deny or avoid unfavorable information or try to control situations. Instead, you want to be flexible in your optimism particularly when your bad boss is dragging you under, but not when clear sight or owning up is actually required. Minimizing the impact of your bad boss – Dealing with negative people in our lives isn’t easy, but our best options are to modify the situation, attend to it differently or change its meaning. Rather than trying to avoid our bad boss, these techniques neutralize negativity by extending empathy, compassion and openness to the person who is lashing out. It’s a simple fact that dire interpretations create dire emotions, whilst charitable and optimistic interpretations breed positivity. Try to modify the situation by experimenting with how you act when you’re with your boss. Think of it as a series of tests for cause and effect – of when I do this… that happens – in which your goal is to find the responses which bring out the best in your bad boss. Practicing kindness – Probably the last thing you feel like doing with a bad boss, yet practicing kindness – even when it’s unpleasant or we expect to receive nothing in return – is in our own self-interest. Being generous and willing to share helps you to engage in seeing others more positively, feeling more connected and being more grateful. It also makes us feel more advantaged by comparison (e.g. 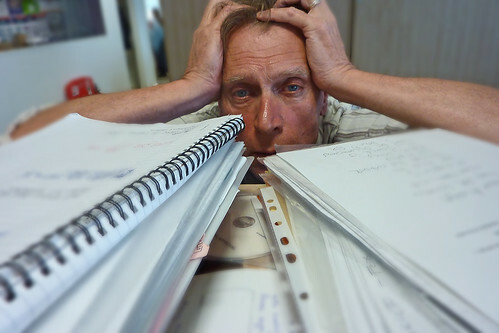 I’m glad I’m not so overwhelmed by my job that I’ve forgotten how to smile) and highlights our abilities, resources, and expertise to create feelings of control over our lives. Best of all, it can jump-start a cascade of positive social consequences influencing others to like you, to appreciate you and to reciprocate when you need kindness. If you can’t do something kind for your bad boss then at least do it for a colleague who may also be suffering! Telling your boss – If you really want to a have a healthy conversation with your bad boss about how unhappy they’re making you then you have to make them feel safe first. This can be achieved by finding a shared goal so that both of you have a good reason for talking and by showing respect during the conversation. Barb told me that a few years ago she came across a greeting card that read: “Life gives us negativity on its own. It’s our job to create positivity.” She said she liked this phrasing because it reminds us that positivity is a choice – even with a bad boss – a choice we all need to make again and again, day after day. As a result of all she taught me, I’m particularly careful to gauge the balance of positivity to negativity in my life by using her free five minute Positivity Test online. When I find it falling below three to one I use many of these strategies to improve the way I’m feeling about work. Ready to rid the world of bad bosses? 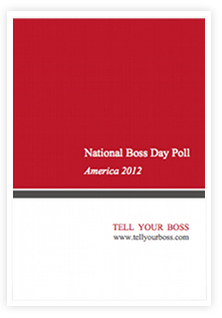 Join us on October 16th, National Boss Day. Follow us on Twitter @TellYourBoss for updates and to join the revolution. If you or anyone you love has ever suffered at the hands of a bad boss then get the best revenge of all by signing our petition. The world needs better bosses so if you or anyone you love has ever suffered at the hands of a bad boss then get the very best revenge of all by signing this petition to help us bring this issue to the attention of government, business and media and be sure to share it with your family and friends.